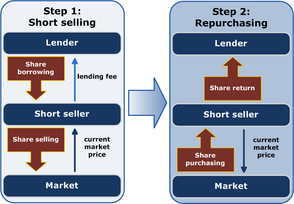 Schematic representation of short selling in two steps. The short seller borrows shares and immediately sells them. The short seller then expects the price to decrease, when the seller can profit by purchasing the shares to return to the lender. In finance, a short sale (also known as a short, shorting, or going short) is the sale of an asset (securities or other financial instrument) that the seller has borrowed in order to profit from a subsequent fall in the price of the asset. After borrowing the asset, the short seller sells it to a buyer at the market price at that time. Subsequently, the resulting short position is "covered" when the seller repurchases the same asset (i.e. an instrument of the same type) in a market transaction and delivers the purchased asset back to the lender to replace the asset that was initially borrowed. In the event of an interim price decline, the short seller will profit, since the cost of (re)purchase will be less than the proceeds received upon the initial (short) sale. Conversely, the short position will result in a loss if the price of a shorted asset rises prior to repurchase. "Shorting" can also refer more generally to the use of derivatives or other techniques to achieve the same effect, such that the investor profits from the fall in the value of an asset even without undertaking the borrowing of securities. Potential loss on a short sale is theoretically unlimited, as there is no theoretical limit to a rise in the price of the instrument. However, in practice, the short seller is required to post margin or collateral to cover losses, and inability to do so in a timely way would cause its broker or counterparty to liquidate the position. In the securities markets, the seller generally must borrow the securities to effect delivery in the short sale. In some cases, the short seller must pay a fee to borrow the securities and must additionally reimburse the lender for cash returns the lender would have received had the securities not been loaned out. Short selling is most commonly done with instruments traded in public securities, futures or currency markets, due to the liquidity and real-time price dissemination characteristic of such markets and because the instruments defined within each class are fungible. A short sale may have a variety of objectives. Speculators may sell short hoping to realize a profit on an instrument that appears overvalued, just as long investors or speculators hope to profit from a rise in the price of an instrument that appears undervalued. Traders or fund managers may hedge a long position or a portfolio through one or more short positions. In contrast to a traditional merchant who sets out to "buy low, sell high", a short-seller sets out to "sell high, buy low", or even to "buy high, sell low" when this buy is in fact "on tick". Research indicates that banning short selling is ineffective and has negative effects on markets. Nevertheless short selling is subject to criticism and periodically faces hostility from society and policymakers. The following example describes the short sale of a security. To profit from a decrease in the price of a security, a short seller can borrow the security and sell it expecting that it will be cheaper to repurchase in the future. When the seller decides that the time is right (or when the lender recalls the securities), the seller buys equivalent securities and returns them to the lender. The process relies on the fact that the securities (or the other assets being sold short) are fungible; the term "borrowing" is therefore used in the sense of borrowing cash, where different bank notes or coins can be returned to the lender (as opposed to borrowing a bicycle, where the same bicycle must be returned). A short seller typically borrows through a broker, who is usually holding the securities for another investor who owns the securities; the broker himself seldom purchases the securities to lend to the short seller. The lender does not lose the right to sell the securities while they have been lent, as the broker usually holds a large pool of such securities for a number of investors which, as such securities are fungible, can instead be transferred to any buyer. In most market conditions there is a ready supply of securities to be borrowed, held by pension funds, mutual funds and other investors. The act of buying back the securities that were sold short is called "covering the short" or "covering the position". A short position can be covered at any time before the securities are due to be returned. Once the position is covered, the short seller is not affected by subsequent rises or falls in the price of the securities, as he already holds the securities required to repay the lender. Short selling refers broadly to any transaction used by an investor to profit from the decline in price of a borrowed asset or financial instrument. However some short positions, for example those undertaken by means of derivatives contracts, are not technically short sales because no underlying asset is actually delivered upon the initiation of the position. Derivatives contracts include futures, options, and swaps. Shares in ACME Inc. currently trade at $10 per share. A short seller investor borrows from a lender 100 shares of ACME Inc. and immediately sells them for a total of $1,000. Subsequently, the price of the shares falls to $8 per share. Short seller now buys 100 shares of ACME Inc. for $800. Short seller returns the shares to the lender, who must accept the return of the same number of shares as was lent despite the fact that the market value of the shares has decreased. Short seller profits from the $200 difference (minus borrowing fees) between the price at which the short seller sold the shares, which were borrowed, and the lower price at which the short seller repurchased the shares sold. A short seller investor owns 100 shares of ACME Inc. and sells them for a total of $1,000. Short seller now buys 100 shares of ACME Inc. for $800, or alternatively, purchases 125 shares for $1,000. Short seller retains as profit the $200 difference between the price at which the short seller sold the shares owned and the lower price at which the short seller was able to repurchase the shares. A short seller borrows 100 shares of ACME Inc. and immediately sells them for a total of $1,000. Subsequently, the price of the shares rises to $25. Short seller is required to return the shares, and is compelled to buy 100 shares of ACME Inc. for $2,500. Short seller returns the shares to the lender who accepts the return of the same number of shares as was lent. Short seller incurs as a loss the $1,500 difference between the price at which he sold the shares borrowed and the higher price at which the short seller had to repurchase the shares (plus borrowing fees). Replica of an East Indiaman of the Dutch East India Company/United East India Company (VOC). 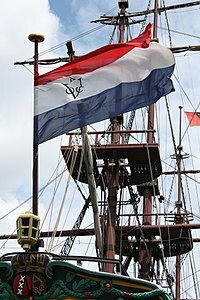 The Dutch East India Company and its shareholders played a crucial role in the transformation of modern-day global financial markets, causing a number of 'innovations' to be introduced, such as futures contracts, stock options, short selling, and bear raid. 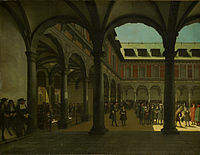 Courtyard of the Amsterdam Stock Exchange (Beurs van Hendrick de Keyser in Dutch). In 1611, the Dutch East India Company (VOC) launched the world's first official stock exchange in Amsterdam. The first documented effort of the short selling of securities in financial history dates to 1609, when Isaac Le Maire, a sizeable shareholder of the VOC, initiated the first recorded bear raid, selling shares of the Company short in order to buy them back at a profit. An early practice of financial regulation was the first recorded ban on short selling that was enacted by the Dutch authorities as early as 1610. The practice of short selling was likely invented in 1609 by Dutch businessman Isaac Le Maire, a sizeable shareholder of the Dutch East India Company (Vereenigde Oostindische Compagnie or VOC in Dutch). Edward Stringham has written extensively on the development of sophisticated contracts on the Amsterdam Stock Exchange in the seventeenth century, including short sale contracts. Short selling can exert downward pressure on the underlying stock, driving down the price of shares of that security. This, combined with the seemingly complex and hard-to-follow tactics of the practice, has made short selling a historical target for criticism. At various times in history, governments have restricted or banned short selling. The London banking house of Neal, James, Fordyce and Down collapsed in June 1772, precipitating a major crisis that included the collapse of almost every private bank in Scotland, and a liquidity crisis in the two major banking centres of the world, London and Amsterdam. The bank had been speculating by shorting East India Company stock on a massive scale, and apparently using customer deposits to cover losses. It was perceived as having a magnifying effect in the violent downturn in the Dutch tulip market in the eighteenth century. In another well-referenced example, George Soros became notorious for "breaking the Bank of England" on Black Wednesday of 1992, when he sold short more than $10 billion worth of pounds sterling. The term "short" was in use from at least the mid-nineteenth century. It is commonly understood that "short" is used because the short-seller is in a deficit position with his brokerage house. Jacob Little was known as The Great Bear of Wall Street who began shorting stocks in the United States in 1822. Short sellers were blamed for the Wall Street Crash of 1929. Regulations governing short selling were implemented in the United States in 1929 and in 1940. Political fallout from the 1929 crash led Congress to enact a law banning short sellers from selling shares during a downtick; this was known as the uptick rule, and this was in effect until 3 July 2007 when it was removed by the Securities and Exchange Commission (SEC Release No. 34-55970). President Herbert Hoover condemned short sellers and even J. Edgar Hoover said he would investigate short sellers for their role in prolonging the Depression. A few years later, in 1949, Alfred Winslow Jones founded a fund (that was unregulated) that bought stocks while selling other stocks short, hence hedging some of the market risk, and the hedge fund was born. Negative news, such as litigation against a company, may also entice professional traders to sell the stock short in hope of the stock price going down. During the dot-com bubble, shorting a start-up company could backfire since it could be taken over at a price higher than the price at which speculators shorted. Short-sellers were forced to cover their positions at acquisition prices, while in many cases the firm often overpaid for the start-up. During the 2008 financial crisis, critics argued that investors taking large short positions in struggling financial firms like Lehman Brothers, HBOS and Morgan Stanley created instability in the stock market and placed additional downward pressure on prices. In response, a number of countries introduced restrictive regulations on short-selling in 2008 and 2009. Naked short selling is the practice of short-selling a tradable asset without first borrowing the security or ensuring that the security can be borrowed – it was this practice that was commonly restricted. Investors argued that it was the weakness of financial institutions, not short-selling, that drove stocks to fall. In September 2008, the Securities Exchange Commission in the United States abruptly banned short sales, primarily in financial stocks, to protect companies under siege in the stock market. That ban expired several weeks later as regulators determined the ban was not stabilizing the price of stocks. Temporary short-selling bans were also introduced in the United Kingdom, Germany, France, Italy and other European countries in 2008 to minimal effect. Australia moved to ban naked short selling entirely in September 2008. Germany placed a ban on naked short selling of certain euro zone securities in 2010. Spain, Portugal and Italy introduced short selling bans in 2011 and again in 2012. Worldwide, economic regulators seem inclined to restrict short selling to decrease potential downward price cascades. Investors continue to argue this only contributes to market inefficiency. The speculator instructs the broker to sell the shares and the proceeds are credited to the broker's account at the firm, on which the firm can earn interest. Generally, the short seller does not earn interest on the short proceeds and cannot use or encumber the proceeds for another transaction. Upon completion of the sale, the investor typically has a limited time (for example, 3 days in the US) to borrow the shares. If required by law, the investor first ensures that cash or equity is on deposit with his brokerage firm as collateral for the initial short margin requirement. Some short sellers, mainly firms and hedge funds, participate in the practice of naked short selling, where the shorted shares are not borrowed or delivered. The speculator may close the position by buying back the shares (called covering). If the price has dropped, he makes a profit. If the stock advanced, he takes a loss. Finally, the speculator may return the shares to the lender or stay short indefinitely. At any time, the lender may call for the return of his shares, e.g., because he wants to sell them. The borrower must buy shares on the market and return them to the lender (or he must borrow the shares from elsewhere). When the broker completes this transaction automatically, it is called a 'buy-in'. The buyer deposit margin into the margin account. The seller deposit margin into the margin account. The buyer enters an instruction to buy on margin. The seller enters an instruction to sell short. Within the time to delivery, the brokerage lends money using the bought security as collateral, and the stock is bought with borrowed money. Within the time to delivery, the brokerage lends the stock, using the sale amount and deposited margin as collateral, and the borrowed stock is sold. The buyer holds positive stock and negative cash. The seller holds negative stock and positive cash. The buyer pays interest on the borrowed money. The seller pays interest on the borrowed stock. If dividend is given out from the stock, the buyer receives it. If dividend is given out from the stock, the seller pays it. If the stock price drops such that the value is below maintenance margin, the buyer has to deposit additional fund to cover it, otherwise forced selling may happen. If the stock price rises such that the value is below maintenance margin, the buyer has to deposit additional fund to cover it, otherwise forced buying may happen. To close the position, the buyer sells the stock to repay the loan in cash, pocketing the price difference between the buying price and the selling price. To close the position, the seller buys the stock to repay the loan in stock, pocketing the price difference between the selling price and the buying price. To sell stocks short in the U.S., the seller must arrange for a broker-dealer to confirm that it can deliver the shorted securities. This is referred to as a locate. Brokers have a variety of means to borrow stocks to facilitate locates and make good on delivery of the shorted security. The vast majority of stocks borrowed by U.S. brokers come from loans made by the leading custody banks and fund management companies (see list below). Institutions often lend out their shares to earn extra money on their investments. These institutional loans are usually arranged by the custodian who holds the securities for the institution. In an institutional stock loan, the borrower puts up cash collateral, typically 102% of the value of the stock. The cash collateral is then invested by the lender, who often rebates part of the interest to the borrower. The interest that is kept by the lender is the compensation to the lender for the stock loan. Most brokers allow retail customers to borrow shares to short a stock only if one of their own customers has purchased the stock on margin. Brokers go through the "locate" process outside their own firm to obtain borrowed shares from other brokers only for their large institutional customers. Stock exchanges such as the NYSE or the NASDAQ typically report the "short interest" of a stock, which gives the number of shares that have been legally sold short as a percent of the total float. Alternatively, these can also be expressed as the short interest ratio, which is the number of shares legally sold short as a multiple of the average daily volume. These can be useful tools to spot trends in stock price movements but for them to be reliable, investors must also ascertain the number of shares brought into existence by naked shorters. Speculators are cautioned to remember that for every share that has been shorted (owned by a new owner), a 'shadow owner' exists (i.e., the original owner) who also is part of the universe of owners of that stock, i.e., despite having no voting rights, he has not relinquished his interest and some rights in that stock. When a security is sold, the seller is contractually obliged to deliver it to the buyer. If a seller sells a security short without owning it first, the seller must borrow the security from a third party to fulfill its obligation. Otherwise, the seller fails to deliver, the transaction does not settle, and the seller may be subject to a claim from its counterparty. Certain large holders of securities, such as a custodian or investment management firm, often lend out these securities to gain extra income, a process known as securities lending. The lender receives a fee for this service. Similarly, retail investors can sometimes make an extra fee when their broker wants to borrow their securities. This is only possible when the investor has full title of the security, so it cannot be used as collateral for margin buying. Time delayed short interest data (for legally shorted shares) is available in a number of countries, including the US, the UK, Hong Kong, and Spain. The number of stocks being shorted on a global basis has increased in recent years for various structural reasons (e.g., the growth of 130/30 type strategies, short or bear ETFs). The data is typically delayed; for example, the NASDAQ requires its broker-dealer member firms to report data on the 15th of each month, and then publishes a compilation eight days later. Some market data providers (like Data Explorers and SunGard Financial Systems) believe that stock lending data provides a good proxy for short interest levels (excluding any naked short interest). SunGard provides daily data on short interest by tracking the proxy variables based on borrowing and lending data it collects. Days to Cover (DTC) is a numerical term that describes the relationship between the number of shares in a given equity that has been legally short-sold and the number of days of typical trading that it would require to 'cover' all legal short positions outstanding. For example, if there are ten million shares of XYZ Inc. that are currently legally short-sold and the average daily volume of XYZ shares traded each day is one million, it would require ten days of trading for all legal short positions to be covered (10 million / 1 million). Short Interest is a numerical term that relates the number of shares in a given equity that have been legally shorted divided by the total shares outstanding for the company, usually expressed as a percent. For example, if there are ten million shares of XYZ Inc. that are currently legally short sold, and the total number of shares issued by the company is one hundred million, the Short Interest is 10% (10 million / 100 million). If however, shares are being created through naked short selling, "fails" data must be accessed to assess accurately the true level of short interest. Borrow cost is the fee paid to a securities lender for borrowing the stock or other security. The cost of borrowing the stock is usually negligible compared to fees paid and interest accrued on the margin account - in 2002, 91% of stocks could be shorted for less than a 1% fee per annum, generally lower than interest rates earned on the margin account. However, certain stocks become "hard to borrow" as stockholders willing to lend their stock become more difficult to locate. The cost of borrowing these stocks can become significant - in February 2001, the cost to borrow (short) Krispy Kreme stock reached an annualized 55%, indicating that a short seller would need to pay the lender more than half the price of the stock over the course of the year, essentially as interest for borrowing a stock in limited supply. This has important implications for derivatives pricing and strategy, as the borrow cost itself can become a significant convenience yield for holding the stock (similar to additional dividend) - for instance, put-call parity relationships are broken and the early exercise feature of American call options on non-dividend paying stocks can become rational to exercise early, which otherwise would not be economical. A naked short sale occurs when a security is sold short without borrowing the security within a set time (for example, three days in the US.) This means that the buyer of such a short is buying the short-seller's promise to deliver a share, rather than buying the share itself. The short-seller's promise is known as a hypothecated share. When the holder of the underlying stock receives a dividend, the holder of the hypothecated share would receive an equal dividend from the short seller. Naked shorting has been made illegal except where allowed under limited circumstances by market makers. It is detected by the Depository Trust & Clearing Corporation (in the US) as a "failure to deliver" or simply "fail.” While many fails are settled in a short time, some have been allowed to linger in the system. In the US, arranging to borrow a security before a short sale is called a locate. In 2005, to prevent widespread failure to deliver securities, the U.S. Securities and Exchange Commission (SEC) put in place Regulation SHO, intended to prevent speculators from selling some stocks short before doing a locate. Requirements that are more stringent were put in place in September 2008, ostensibly to prevent the practice from exacerbating market declines. The rules were made permanent in 2009. When a broker facilitates the delivery of a client's short sale, the client is charged a fee for this service, usually a standard commission similar to that of purchasing a similar security. If the short position begins to move against the holder of the short position (i.e., the price of the security begins to rise), money is removed from the holder's cash balance and moved to their margin balance. If short shares continue to rise in price, and the holder does not have sufficient funds in the cash account to cover the position, the holder begins to borrow on margin for this purpose, thereby accruing margin interest charges. These are computed and charged just as for any other margin debit. Therefore, only margin accounts can be used to open a short position. When a security's ex-dividend date passes, the dividend is deducted from the shortholder's account and paid to the person from whom the stock is borrowed. For some brokers, the short seller may not earn interest on the proceeds of the short sale or use it to reduce outstanding margin debt. These brokers may not pass this benefit on to the retail client unless the client is very large. The interest is often split with the lender of the security. Where shares have been shorted and the company that issues the shares distributes a dividend, the question arises as to who receives the dividend. The new buyer of the shares, who is the holder of record and holds the shares outright, receives the dividend from the company. However, the lender, who may hold its shares in a margin account with a prime broker and is unlikely to be aware that these particular shares are being lent out for shorting, also expects to receive a dividend. The short seller therefore pays the lender an amount equal to the dividend to compensate—though technically, as this payment does not come from the company, it is not a dividend. The short seller is therefore said to be short the dividend. A similar issue comes up with the voting rights attached to the shorted shares. Unlike a dividend, voting rights cannot legally be synthesized and so the buyer of the shorted share, as the holder of record, controls the voting rights. The owner of a margin account from which the shares were lent agreed in advance to relinquish voting rights to shares during the period of any short sale. As noted earlier, victims of naked shorting sometimes report that the number of votes cast is greater than the number of shares issued by the company. When trading futures contracts, being 'short' means having the legal obligation to deliver something at the expiration of the contract, although the holder of the short position may alternately buy back the contract prior to expiration instead of making delivery. Short futures transactions are often used by producers of a commodity to fix the future price of goods they have not yet produced. Shorting a futures contract is sometimes also used by those holding the underlying asset (i.e. those with a long position) as a temporary hedge against price declines. Shorting futures may also be used for speculative trades, in which case the investor is looking to profit from any decline in the price of the futures contract prior to expiration. An investor can also purchase a put option, giving that investor the right (but not the obligation) to sell the underlying asset (such as shares of stock) at a fixed price. In the event of a market decline, the option holder may exercise these put options, obliging the counterparty to buy the underlying asset at the agreed upon (or "strike") price, which would then be higher than the current quoted spot price of the asset. Selling short on the currency markets is different from selling short on the stock markets. Currencies are traded in pairs, each currency being priced in terms of another. In this way, selling short on the currency markets is identical to going long on stocks. Novice traders or stock traders can be confused by the failure to recognize and understand this point: a contract is always long in terms of one medium and short another. When the exchange rate has changed, the trader buys the first currency again; this time he gets more of it, and pays back the loan. Since he got more money than he had borrowed initially, he makes money. Of course, the reverse can also occur. An example of this is as follows: Let us say a trader wants to trade with the US dollar and the Indian rupee currencies. Assume that the current market rate is USD 1 to Rs.50 and the trader borrows Rs.100. With this, he buys USD 2. If the next day, the conversion rate becomes USD 1 to Rs.51, then the trader sells his USD 2 and gets Rs.102. He returns Rs.100 and keeps the Rs.2 profit (minus fees). One may also take a short position in a currency using futures or options; the preceding method is used to bet on the spot price, which is more directly analogous to selling a stock short. Note: this section does not apply to currency markets. Short selling is sometimes referred to as a "negative income investment strategy" because there is no potential for dividend income or interest income. Stock is held only long enough to be sold pursuant to the contract, and one's return is therefore limited to short term capital gains, which are taxed as ordinary income. For this reason, buying shares (called "going long") has a very different risk profile from selling short. Furthermore, a "long's" losses are limited because the price can only go down to zero, but gains are not, as there is no limit, in theory, on how high the price can go. On the other hand, the short seller's possible gains are limited to the original price of the stock, which can only go down to zero, whereas the loss potential, again in theory, has no limit. For this reason, short selling probably is most often used as a hedge strategy to manage the risks of long investments. Many short sellers place a stop order with their stockbroker after selling a stock short—an order to the brokerage to cover the position if the price of the stock should rise to a certain level. This is to limit the loss and avoid the problem of unlimited liability described above. In some cases, if the stock's price skyrockets, the stockbroker may decide to cover the short seller's position immediately and without his consent to guarantee that the short seller can make good on his debt of shares. Short sellers must be aware of the potential for a short squeeze. When the price of a stock rises significantly, some people who are shorting the stock cover their positions to limit their losses (this may occur in an automated way if the short sellers had stop-loss orders in place with their brokers); others may be forced to close their position to meet a margin call; others may be forced to cover, subject to the terms under which they borrowed the stock, if the person who lent the stock wishes to sell and take a profit. Since covering their positions involves buying shares, the short squeeze causes an ever further rise in the stock's price, which in turn may trigger additional covering. Because of this, most short sellers restrict their activities to heavily traded stocks, and they keep an eye on the "short interest" levels of their short investments. Short interest is defined as the total number of shares that have been legally sold short, but not covered. A short squeeze can be deliberately induced. This can happen when large investors (such as companies or wealthy individuals) notice significant short positions, and buy many shares, with the intent of selling the position at a profit to the short sellers, who may be panicked by the initial uptick or who are forced to cover their short positions to avoid margin calls. Another risk is that a given stock may become "hard to borrow." As defined by the SEC and based on lack of availability, a broker may charge a hard to borrow fee daily, without notice, for any day that the SEC declares a share is hard to borrow. Additionally, a broker may be required to cover a short seller's position at any time ("buy in"). The short seller receives a warning from the broker that he is "failing to deliver" stock, which leads to the buy-in. Because short sellers must eventually deliver the shorted securities to their broker, and need money to buy them, there is a credit risk for the broker. The penalties for failure to deliver on a short selling contract inspired financier Daniel Drew to warn: "He who sells what isn't his'n, Must buy it back or go to pris'n." To manage its own risk, the broker requires the short seller to keep a margin account, and charges interest of between 2% and 8% depending on the amounts involved. In 2011, the eruption of the massive China stock frauds on North American equity markets brought a related risk to light for the short seller. The efforts of research-oriented short sellers to expose these frauds eventually prompted NASDAQ, NYSE and other exchanges to impose sudden, lengthy trading halts that froze the values of shorted stocks at artificially high values. Reportedly in some instances, brokers charged short sellers excessively large amounts of interest based on these high values as the shorts were forced to continue their borrowings at least until the halts were lifted. Short sellers tend to temper overvaluation by selling into exuberance. Likewise, short sellers are said to provide price support by buying when negative sentiment is exacerbated after a significant price decline. Short selling can have negative implications if it causes a premature or unjustified share price collapse when the fear of cancellation due to bankruptcy becomes contagious. A farmer who has just planted their wheat wants to lock in the price at which they can sell after the harvest. The farmer would take a short position in wheat futures. A market maker in corporate bonds is constantly trading bonds when clients want to buy or sell. This can create substantial bond positions. The largest risk is that interest rates overall move. The trader can hedge this risk by selling government bonds short against his long positions in corporate bonds. In this way, the risk that remains is credit risk of the corporate bonds. An arbitrageur who buys long futures contracts on a US Treasury security, and sells short the underlying US Treasury security. One variant of selling short involves a long position. "Selling short against the box" consists of holding a long position on which the shares have already risen, whereupon one then enters a short sell order for an equal number of shares. The term box alludes to the days when a safe deposit box was used to store (long) shares. The purpose of this technique is to lock in paper profits on the long position without having to sell that position (and possibly incur taxes if said position has appreciated). Once the short position has been entered, it serves to balance the long position taken earlier. Thus, from that point in time, the profit is locked in (less brokerage fees and short financing costs), regardless of further fluctuations in the underlying share price. For example, one can ensure a profit in this way, while delaying sale until the subsequent tax year. U.S. investors considering entering into a "short against the box" transaction should be aware of the tax consequences of this transaction. Unless certain conditions are met, the IRS deems a "short against the box" position to be a "constructive sale" of the long position, which is a taxable event. These conditions include a requirement that the short position be closed out within 30 days of the end of the year and that the investor must hold their long position, without entering into any hedging strategies, for a minimum of 60 days after the short position has been closed. The Securities and Exchange Act of 1934 gave the Securities and Exchange Commission the power to regulate short sales. The first official restriction on short selling came in 1938, when the SEC adopted a rule known as the uptick rule that dictated that a short sale could only be made when the price of a particular stock was higher than the previous trade price. The uptick rule aimed to prevent short sales from causing or exacerbating market price declines. In January 2005, The Securities and Exchange Commission enacted Regulation SHO to target abusive naked short selling. Regulation SHO was the SEC's first update to short selling restrictions since the uptick rule in 1938. The regulation contains two key components: the "locate" and the "close-out." The locate component attempts to reduce failure to deliver securities by requiring a broker possess or have arranged to possess borrowed shares. The close out component requires that a broker be able to deliver the shares that are to be shorted. In the US, initial public offers (IPOs) cannot be sold short for a month after they start trading. This mechanism is in place to ensure a degree of price stability during a company's initial trading period. However, some brokerage firms that specialize in penny stocks (referred to colloquially as bucket shops) have used the lack of short selling during this month to pump and dump thinly traded IPOs. Canada and other countries do allow selling IPOs (including U.S. IPOs) short. The Securities and Exchange Commission initiated a temporary ban on short selling on 799 financial stocks from 19 September 2008 until 2 October 2008. Greater penalties for naked shorting, by mandating delivery of stocks at clearing time, were also introduced. Some state governors have been urging state pension bodies to refrain from lending stock for shorting purposes. An assessment of the effect of the temporary ban on short-selling in the United States and other countries in the wake of the financial crisis showed that it had only "little impact" on the movements of stocks, with stock prices moving in the same way as they would have moved anyhow, but the ban reduced volume and liquidity. In the UK, the Financial Services Authority had a moratorium on short selling 29 leading financial stocks, effective from 2300 GMT, 19 September 2008 until 16 January 2009. After the ban was lifted, John McFall, chairman of the Treasury Select Committee, House of Commons, made clear in public statements and a letter to the FSA that he believed it ought to be extended. Between 19 and 21 September 2008, Australia temporarily banned short selling, and later placed an indefinite ban on naked short selling. Australia's ban on short selling was further extended for another 28 days on 21 October 2008. Also during September 2008, Germany, Ireland, Switzerland and Canada banned short selling leading financial stocks, and France, the Netherlands and Belgium banned naked short selling leading financial stocks. By contrast with the approach taken by other countries, Chinese regulators responded by allowing short selling, along with a package of other market reforms. Advocates of short selling argue that the practice is an essential part of the price discovery mechanism. Financial researchers at Duke University said in a study that short interest is an indicator of poor future stock performance (the self-fulfilling aspect) and that short sellers exploit market mistakes about firms' fundamentals. Such noted investors as Seth Klarman and Warren Buffett have said that short sellers help the market. Klarman argued that short sellers are a useful counterweight to the widespread bullishness on Wall Street, while Buffett believes that short sellers are useful in uncovering fraudulent accounting and other problems at companies. Shortseller James Chanos received widespread publicity when he was an early critic of the accounting practices of Enron. Chanos responds to critics of short-selling by pointing to the critical role they played in identifying problems at Enron, Boston Market and other "financial disasters" over the years. In 2011, research oriented short sellers were widely acknowledged for exposing the China stock frauds. Commentator Jim Cramer has expressed concern about short selling and started a petition calling for the reintroduction of the uptick rule. Books like Don't Blame the Shorts by Robert Sloan and Fubarnomics by Robert E. Wright suggest Cramer exaggerated the costs of short selling and underestimated the benefits, which may include the ex ante identification of asset bubbles. Individual short sellers have been subject to criticism and even litigation. Manuel P. Asensio, for example, engaged in a lengthy legal battle with the pharmaceutical manufacturer Hemispherx Biopharma. Several studies of the effectiveness of short selling bans indicate that short selling bans do not contribute to more moderate market dynamics. ^ "Understanding Short Selling - A Primer". Langasset.com. Retrieved 24 May 2012. ^ Larry Harris (2002). Trading and Exchange: Market Microstructure for Practitioners. Oxford University Press. p. 41. ISBN 978-0195144703. ^ Taylor, Bryan (6 November 2013). "The Rise and Fall of the Largest Corporation in History". BusinessInsider.com. Retrieved 18 April 2018. ^ Kestenbaum, David (29 January 2015). "The Spicy History Of Short Selling Stocks". NPR.org. Retrieved 29 April 2018. ^ "'Naakt short gaan', een oud-Hollands kunstje". nrc.nl. ^ Stringham, Edward (2003). "The Extralegal Development of Securities Trading in Seventeenth Century Amsterdam". Quarterly Review of Economics and Finance. 43 (2): 321. doi:10.1016/S1062-9769(02)00153-9. SSRN 1676251. ^ "Scripophily - PSTA - Professional Scripophily Trade Association". Encyberpedia.com. Retrieved 24 May 2012. ^ "Short sellers have been the villain for 400 years". Reuters. 26 September 2008. Retrieved 28 September 2008. ^ "SEC Release No. 34-55970" (PDF). Retrieved 24 May 2012. ^ Lindgren, Hugo (9 April 2007). "New York Magazine - The Creation of the Hedge Fund". Nymag.com. Retrieved 24 May 2012. ^ a b c Lavinio, Stefano (1999). The Hedge Fund Handbook: A Definitive Guide for Analyzing and Evaluating Alternative Investments. McGraw-Hill. pp. 442–443. ISBN 978-0071350303. ^ a b Madura, Jeff (2009). Financial Markets and Institutions. South-Western College Publishing. p. 308. ISBN 978-1439038840. ^ a b Harris, Larry (7 October 2008). "A Debate as a Ban on Short-Selling Ends: Did It Make Any Difference?". The New York Times. Retrieved 12 September 2012. ^ a b Oakley, David (18 December 2008). "Short-selling ban has minimal effect". Financial Times. Retrieved 12 September 2012. ^ Crawford, Alan (18 May 2010). "Germany to Temporarily Ban Naked Short Selling, Some Swaps of Euro Bonds". Bloomberg. Retrieved 13 September 2012. ^ NASDAQ. About the Short Interest Page. ^ SunGard's ShortSide.com discusses the product. ^ SunGard. SunGard Launches Borrow Indices; First Proxy for Measuring Short Interest on a Daily Basis. Business Wire. ^ "The market for borrowing stock" (PDF). Retrieved 25 December 2012. ^ "Lecture 13: Hard to Borrow Securities" (PDF). Retrieved 25 December 2012. ^ Greg LandContactAll Articles (15 May 2009). "Over-voting at Taser in 2005". Law.com. Retrieved 10 May 2018. ^ Arnold, Roger (14 January 2000). "Knowing the Rules of the Shorting Game". TheStreet. Retrieved 24 May 2012. ^ "margin account rates schedule". ScotTrade. 18 June 2011. ^ "Even Short-Sellers Burned by Chinese Shares". Barrons. 18 June 2011. ^ Fabozzi, Frank J. (17 November 2004). The Theory and Practice of Short Selling, Chapter 9, Conclusions and Implications for Investors by Frank J. Fabozzi, Editor. ISBN 9780471704331. Retrieved 24 May 2012. ^ "United States IRS Publication 550 Investment Income and Expenses". Irs.gov. Retrieved 24 May 2012. ^ "Securities Exchange Act of 1934" (PDF). Securities and Exchange Commission. 1934. ^ a b Lavinio, Stefano (1999). The Hedge Fund Handbook: A Definitive Guide for Analyzing and Evaluating Alternative Investments. McGraw-Hill. pp. 85–95. ISBN 978-0071350303. ^ S.K. Singh (2009). Bank Regulations. Discovery Publishing House. pp. 122–123. ISBN 978-8183564472. ^ U.S. SEC (11 April 2005). "Division of Market Regulation: Key Points about Regulation SHO". ^ Young, Matthew G. (2010). The Complete Guide to Selling Stocks Short: Everything You Need to Know Explained Simply. Atlantic Publishing Group Inc. pp. 178–179. ISBN 978-1601383266. ^ Mahipal Singh (2011). Security Analysis with Investment and Portfolio Management. Gyan Books. p. 233. ISBN 978-8182055193. ^ Tsang, Michael (19 September 2008). "Short Sellers under Fire in U.S., U.K. After AIG Fall". bloomberg.com. ^ BBC (18 September 2008). "FSA clamps down on short-selling". BBC News. Retrieved 4 January 2010. ^ "The Australian". 2 October 2008. ^ "ASX ban on short selling is indefinite". The Sydney Morning Herald. 3 October 2008. Archived from the original on 5 October 2008. ^ "Australian Securities and Investments Commission - 08-210 ASIC extends ban on covered short selling". Asic.gov.au. Archived from the original on 20 March 2012. Retrieved 24 May 2012. ^ McDonald, Sarah (22 September 2008). "Australian short selling ban goes further than other bourses". National Business Review. Archived from the original on 27 September 2011. Retrieved 9 November 2011. ^ Ram, Vidya (22 September 2008). "Europe Spooked By Revenge Of The Commodities". Forbes. ^ Shen, Samuel (5 October 2008). "UPDATE 2-China to launch stocks margin trade, short sales". Reuters. ^ Jones, Charles M.; Lamont, Owen A. (20 September 2001). "Short Sale Constraints And Stock Returns by C.M Jones and O.A. Lamont". doi:10.2139/ssrn.281514. SSRN 281514. ^ "Do Short Sellers Convey Information About Changes in Fundamentals or Risk?" (PDF). Retrieved 24 May 2012. ^ Casterline, Rick (1 June 2006). "2006 Berkshire Hathaway Annual Meeting Q&A with Warren Buffett". Fool.com. Archived from the original on 13 June 2006. Retrieved 24 May 2012. ^ Peterson, Jim (6 July 2002). "Balance Sheet : The silly season isn't over yet". The New York Times. Archived from the original on 31 May 2013. Retrieved 9 August 2009. ^ Alpert, Bill (18 June 2011). "B. Alpert "Even Short Sellers Burned by Chinese Shares" (Barrons 20110618)". Online.barrons.com. Retrieved 24 May 2012. ^ "TheStreet". TheStreet. Archived from the original on 15 March 2012. Retrieved 24 May 2012. ^ Nelson, Brett (26 November 2001). "Short Story". Forbes. Retrieved 9 August 2009. ^ Marsh I and Niemer N (2008) "The impact of short sales restrictions". Technical report, commissioned and funded by the International Securities Lending Association (ISLA) the Alternative Investment Management Association (AIMA) and London Investment Banking Association (LIBA). ^ Lobanova O, Hamid S. S. and Prakash A. J. (2010) "The impact of short-sale restrictions on volatility, liquidity, and market efficiency: the evidence from the short-sale ban in the u.s." Technical report, Florida International University - Department of Finance. ^ Beber A. and Pagano M. (2009) "Short-selling bans around the world: Evidence from the 2007-09 crisis". CSEF Working Papers 241, Centre for Studies in Economics and Finance (CSEF), University of Naples, Italy. ^ Kerbl S (2010) "Regulatory Medicine Against Financial Market Instability: What Helps And What Hurts?" arXiv.org.